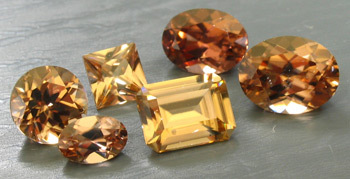 Prices based on The Guide (2010) Wholesale Pricing of Zircon of that particular color... Prices continue to climb due to production issues and this is what the trade will also have to pay should they seek out this material on the current market. Wholesale Prices for the larger blues are actually higher than our current pricing below! 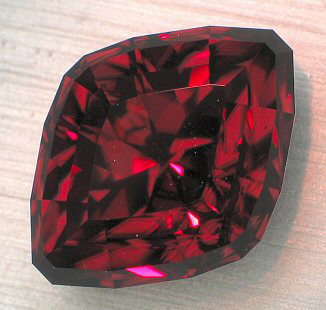 Pinkish to Red Zircon. There are color shifting and depending on the lights available, go for a dusty pink or reddish (with some purple - large oval) ) to brighter deeper pinks or reds. 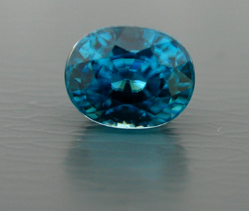 A - 3pcs Deep Blue Zircon, middle gemstone has inclusions as can be seen, but this is also magnified Total weight of 15.65cts (vpng-07-01p) (The two pieces on the side have an interesting unique color also!) 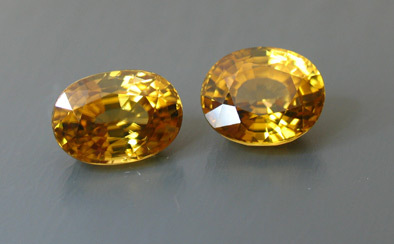 (Pear Shape - Sold! 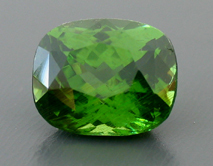 (Trade)) Purchase the two remaining gemstones(10.74cts) at only $175/ct! 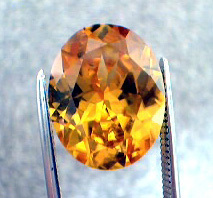 6.03ct Yellow Zircon (Sri Lanka) - Unusual color for this species, especially from Sri Lanka! 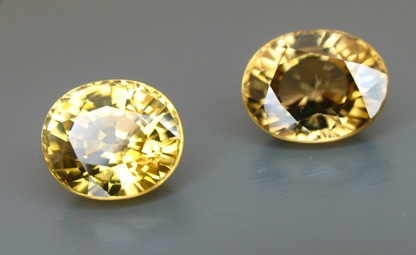 The zircon on the left has been sold (United Kingdom) and the one of the right is currently available. 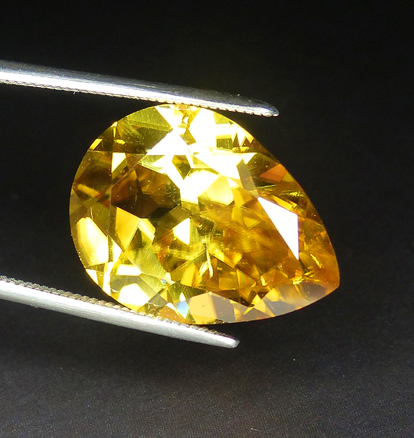 It weighs 7.91cts and would therefore be $791. 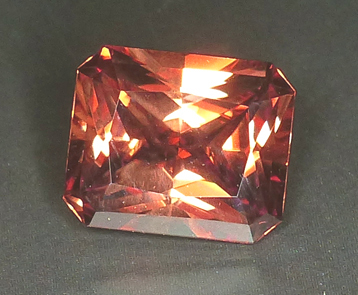 "The zircon has arrived safely and I have to say its better than the photo! 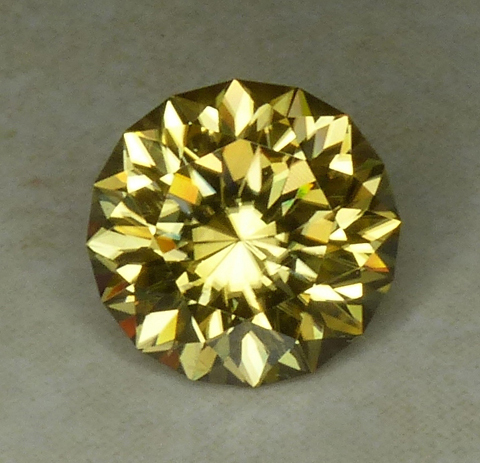 As always your stones are excellently cut and it is perfect for the job." 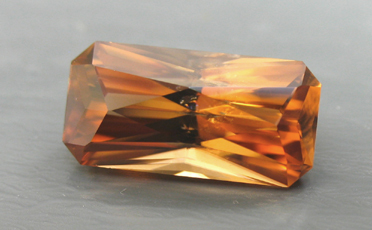 "My Zircon arrived today and what a beautiful gem!!!. It has so much life in different lighting. I just wanted to thank-you again for your assistance. 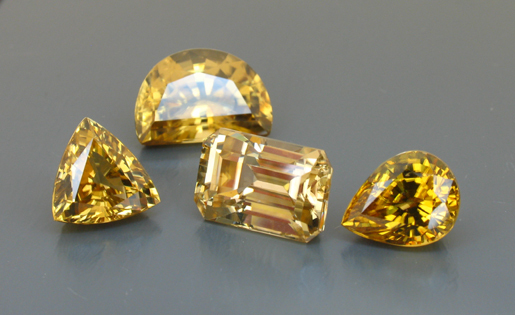 Beautiful gems !!!! Thank you Again !!!!!!!!!!!!"